"It is what we prevent, rather than what we do, that counts the most in government." Canada's longest-reigning Prime Minister was born in Berlin, Ontario, to John King and Isabel Grace Mackenzie, daughter of the famous nineteenth-century Reformer, William Lyon Mackenzie. John and Isabel met in Toronto while John was studying law at the University of Toronto, and got married in 1872. They set up house in Berlin (now Kitchener), where John had established a small local practice. However, John was not aggressive enough to build his practice, and faced mounting debt as the family struggled to keep up appearances and pay for servants. 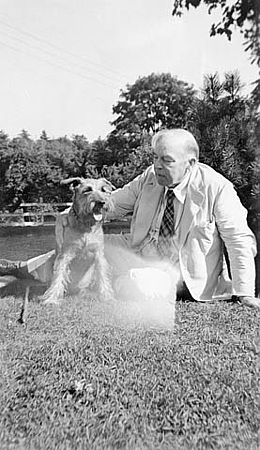 But Mackenzie King retained only happy memories of his childhood at Woodside, the large brick home with an extensive garden that the family moved into in 1886. Young "Willie" was healthy and active, earned good grades in school, and joined both debate and sporting teams. His disarming smile often got him out of punishment when his boyish mischievousness got the better of him. King began classes at the University of Toronto in 1891 as a political science major. Although he graduated second in his class, he still found time for sports, journalism, and student government. In 1895, he even led a student strike to protest the arbitrary dismissal of a popular professor, William Dale. It was in university that he adopted W. L. Mackenzie King as his signature, and his peers called him Mackenzie instead of Willie. 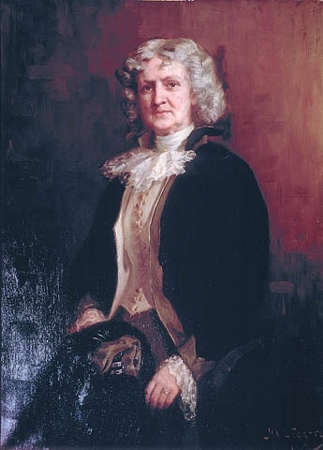 His mother had been fiercely proud of her parentage, and King's new moniker reflected a growing identification with the grandfather he never knew, a man he was coming to idealize "as an early champion of responsible government and political liberty". King's discovery of Arnold Toynbee's writing on the Industrial Revolution led him to the conclusion that industrialism was Christianity's paramount adversary, and he, like his grandfather, absorbed the ideals of social reform. His "liberal commitment to build a better society on earth" was furthermore bulwarked by his dedication to Christian duty. 1 In addition to his extra-curricular activities, he regularly visited young patients at the Hospital for Sick Children and volunteered in a literacy program in one of Toronto's working class districts. Passionate about his ideals but uncertain how he should pursue them after graduation, King juggled his career choices for five years. After spending a summer writing a series of articles about local sweatshops for the Toronto Globe in 1899, he began working on a doctoral thesis on labour conditions in the clothing industry at Harvard. His studies were interrupted after two terms by a telegram from Postmaster General William Mulock, the Deputy Minister of Labour. 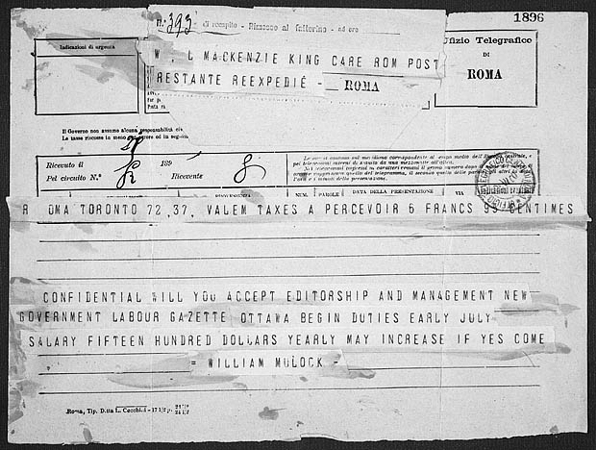 King's articles had drawn Mulock's attention to the link between sweatshops and federal contracts for postbags, and the postmaster general offered him the editorship of the Labour Gazette in Ottawa. King thus began his public service career in late July; a month later, Mulock promoted him to Deputy Minister of Labour. With a remarkable talent for conflict management, King settled numerous strikes and lockouts by winning the confidence of both parties with a sympathetic ear. The government came to call on him to mend a wide range of industrial relations problems from Toronto to Quebec to British Columbia. King, however, became frustrated with having such major responsibilities but no power to enact policy decisions. So, in 1908, at the age of thirty-three, he resigned as deputy minister to run for federal parliament. After winning the Waterloo North riding as the Liberal candidate, Prime Minister Sir Wilfrid Laurier named King Minister of Labour. 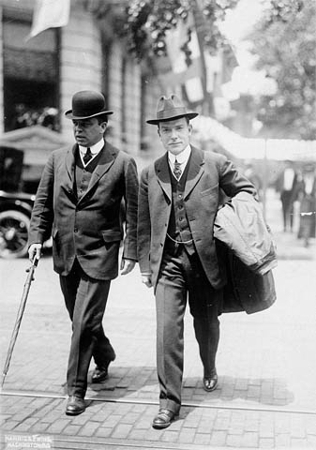 As he began to campaign for an eight-hour work day, Conservatives replaced the Liberal majority in the 1911 election. Despite the setback of King losing his seat, he remained committed to politics. Then, an unexpected offer came from John D. Rockefeller Jr. in 1914. 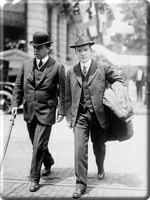 Rockefeller was facing bitter criticism for the Ludlow massacre in the hugely controversial Colorado Coal Strike, and asked King to do a study for the Rockefeller Foundation on industrial relations. Acting as a mentor to the young industrialist, King guided Rockefeller through his labour-relations nightmare. He prompted the settlement negotiation, which included an arrangement for the election of workers to grievance committees for working conditions, safety, and health, and the establishment of a company union. King's report, Industry and Humanity: a Study of Principles Underlying Industrial Reconstruction, came out in 1918, and set the stage for his later success as a politician. Although the report was too theoretical to have practical impact, it cast industrial relations into the light of a broader social context. King, a reformer rather than a radical, rejected the idea of an inevitable class war, suggesting instead that labour and management were partners rather than adversaries. If the partners recognized that they had common interests, and, moreover, had a system in which those interests could be explained and understood, industrial peace was attainable. In labour and in politics, King's cautious and incremental approach ensured that all points of view were presented and that a consensus was reached. King returned to politics in 1919 when Prime Minister Laurier died. When the federal Liberal party opted to have a leadership convention instead of allowing the caucus to select a leader, King emerged as the front-runner. He won the leadership at the most volatile time Canadian politics had yet experienced: tradition had failed them; the post-war world was rife with inflation and unrest, and workers and farmers began turning to radical (and sometimes militant) solutions in greater numbers as they sought a new social and political order. 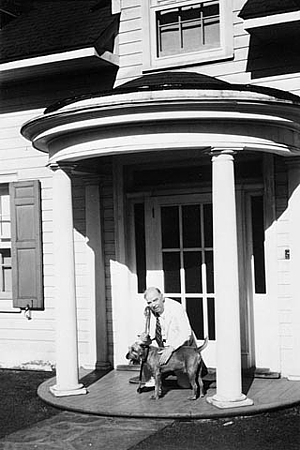 And they looked to Mackenzie King to deliver it to them. The Liberal party proceeded with caution and won a bare majority in the 1921 election, hoisting King into the office of Prime Minister for the first time. King, who still had to prove himself to the public, acted with great strategy to avoid alienating any strong group. While he offered the Ministry of Justice portfolio to former Quebec premier Sir Lomer Gouin, he had a harder time picking a western representative for his cabinet. The Progressives - the post-war party formed to represent the interests of prairie farmers - were too internally divided, and the radical wing threatened to withdraw support from King's top choice, T. A. Crerar, if he accepted a cabinet position. King thus was forced to fill his cabinet with elected Liberals and seek another way to unify the country's anti-Conservative forces. Although the Progressives split over tariff issues in the 1922 budget, King was more successful in uniting them in international affairs. In sharp contrast to Arthur Meighan, Minister of the Interior's policy of preserving the diplomatic unity of the British Empire, King asserted Canada's authority by refusing to militarily support Britain without parliamentary consent during the Canak crisis of 1922. The implications were far-reaching: the British Empire could not have a common imperial policy unless all dominions adhered to Britain's foreign policy. King had taken the first step in a decades-long process toward severing Canada's legal dependence on the British Parliament. His belief that any attempts Britain made to dictate foreign policy encroached upon the authority of the dominions marked a decisive point for the British Commonwealth of Nations. The parties of the 1923 Imperial Conference affirmed that there would be no centralized British Empire. Britain's recognition of the dominions' self-governing powers, King believed, would strengthen rather than weaken the unity of the Commonwealth, given that they shared fundamental political and social values. Despite these successes, however, the Liberal party was still defeated in the 1926 election - even King lost his own seat, prompting the governor general to dissolve parliament. A customs scandal plus in-fighting among Liberals had split the vote enough to allow the Conservatives to take the majority. King fought an aggressive campaign over the summer, distracting voters from the customs scandal by presenting himself as a champion of Canadian autonomy fighting against the imperial interference of the governor general. His sustained efforts to regain the confidence of the farmers over the past five years proved decisive. The Liberals regained a sizable majority with their leader returning for another term as prime minister. As he had explained in 1929 to a correspondent, "The supreme effort of my leadership of the party," King explained to a journalist in 1929, "has been to keep its aims and purposes so broad that it might be possible to unite at times of crisis under one banner those parties, which for one reason or another, have come to be separated from the Liberal party." Two weeks after returning to office, King played an important mediation role at the 1926 Imperial Conference to define the nature of the British Commonwealth of Nations. After much negotiation, Britain finally conceded autonomy to the dominions: the British Commonwealth would now be defined as a voluntary association of nations united by a common allegiance to the Crown, with each autonomous community in the Commonwealth equal to every other community. This meant that the dominions were not bound by Britain's foreign policy decisions, and it also meant that Canada could now pursue and develop its own foreign policies. 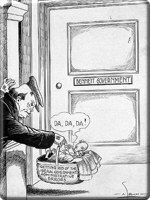 Post-war economic recovery and expansion meant that the government could cut taxes and still reduce national debt while being able to maintain a modest budget surplus, marking King's second term in office with political stability and economic prosperity. The federal government had developed an integrated railway system; the arable prairie land was mostly occupied; and the tariff issue was no longer a deciding economic factor. Canada had arrived, and the era of nation building, begun half a century early by Sir John A. MacDonald, had come to a close. King, however, had no new National Policy to replace the old. While he did introduce old-age pensions in 1926, King used his government's surplus to reduce debt and lower taxes rather than build up Canada's social safety net. Confident that voters would reward his fiscal frugality, he called for elections in 1930. Although it would be two more years until Canada fully felt the repercussions of the stock-market crash of October 1929, the economy began to take a downturn during the first part of the year. King's prudence and caution in the face of recession, however, buckled beneath the dramatic promises R. B. Bennett made to the prairies and Quebec to protect them against what he predicted would become a full-blown economic crisis. The appeal swung enough votes in Quebec to give the Conservatives a majority, and King spent the next five years in official opposition. 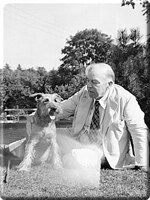 Now fifty-five years old, William Lyon Mackenzie King was well-established in his bachelor lifestyle and had few interests outside of politics. As a young man, he had expected to get married someday, but career ambition had hindered his private life. Finances had further impeded him while he struggled in his early years to pay off his father's debts. After John King died in 1916, William took his ailing mother to live in his Ottawa apartment, and devoted his next two years to fulfilling her increasing demands. 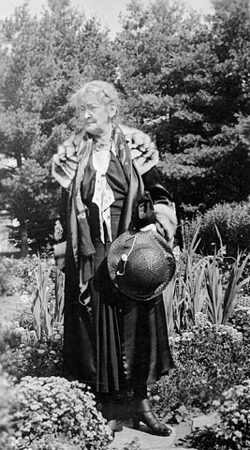 When Isabel died in 1918, King, without close friends or a wife to turn to, was consumed with intense loneliness. After losing his dearest friend, Bert Harper, in 1901, King was unable to develop another deep relationship. He kept his colleagues at arm's length, and although he enjoyed an intimate platonic friendship with Mary Joan Patteson, he needed reassurance that he was loved. 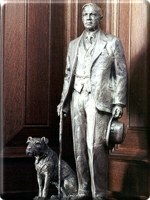 Pat, an Irish terrier given to him in 1924 by Mary and her husband Godfrey, filled that void. "Dear little soul, he is almost human," King gushed in a 1931 diary entry. "I sometimes think he is a comforter dear mother has sent to me, he is filled with her spirit of patience, and tenderness and love." 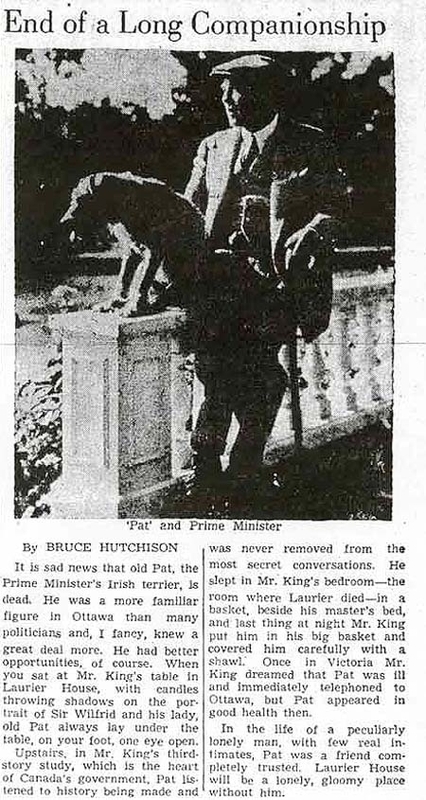 Pat, the "truest friend" King ever had, was privy to many state secrets and conversations between leaders of government, and became something of a government mascot as he and King traipsed around Ottawa during their daily walks. 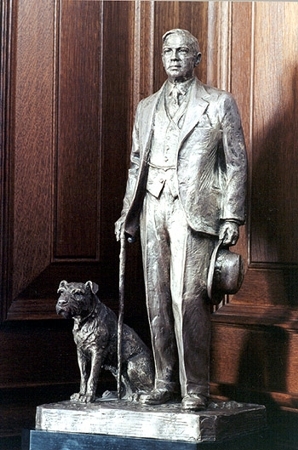 When he died soon after his seventeenth birthday in 1941, the nation paused from the trauma of the Second World War to mourn the passing of a dog who had taught it great lessons of honour and fidelity. "If I have been true to some of the great causes that I have sought to remain true to," King said in an uncharacteristically emotional 1941 radio speech, "it's been the example of that little fellow that has helped in many, many ways." 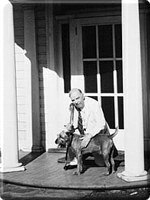 And as that year came to a close, King reflected on the bond that he had shared with Pat: "That little dog taught me how to live, and also how to look forward, without concern, to the arms that will be around me when I, too, pass away." Details of King's personal life slowly came to public light after he died. 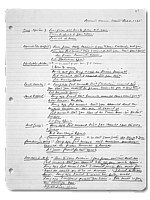 His diary, a sprawling archive of thirty thousand pages that chronicles almost sixty years, is one of Canada's monumental literary achievements, and the eccentricities King kept hidden while alive are revealed in the diary's pages. 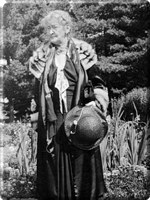 He noted feeling a spiritual presence while visiting the graves of his sister Isabel Christina and his father in 1916, and began to confide these thoughts to his private record. His Presbyterian piety ensured his certainty of eternal life in heaven, a place where he eventually would be reunited with all his loved ones that had passed away. Between 1915 and 1922, King lost his sister, Isabel, his father, his mother, and his brother, Max. 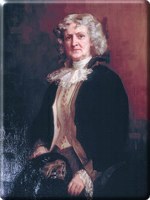 The only immediate relation he had left was his younger sister Jennie, in Barrie, with whom he did not share a close connection. He therefore found reassurance in the belief that his family was watching over him from heaven and was still with him. "I spoke of love being stronger than all else and of my belief in immortal life," he recorded during his visit with his dying brother in Colorado in January 1922. "[Max] said he looked on death as 'The Great Adventure' that even the strongest materialist had to admit that there was much beyond their knowledge & might exist. I told him we would ever be together ... he said to me 'You will be with me and I will be with you always'." King interpreted dreams and coincidences as signs of spiritual presence and affirmation - and as his need for such signs from the spirit world grew, so the ways in which he sought them. Drawing on a long tradition of Scottish folk belief in the blurred boundaries between the temporal and spiritual worlds, King amused himself with fortune-telling methods such as reading tea leaves, horoscopes, and numerology. When he had more leisure time during his years in opposition, he devoted more energy to what he called "psychical research." In 1932, he consulted Mrs. Etta Wriedt, a psychic medium in Detroit, and held a series of s�ances at Kingsmere and the Laurier House. 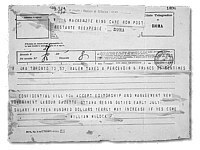 He became a believer after he was able to successfully communicate with his departed family members, including his grandfather William Lyon Mackenzie, his old friend Bert Harper, and even Sir Wilfrid Laurier: "There can be no doubt whatsoever that the persons I have been talking with were the loved ones & others I have known and who have passed away," he wrote in June 1932. The spirits' messages were less important than their presence. The reassurance that the people who had genuinely and deeply cared for King still lived on somewhere gave him the strength to deal with the isolation and stress of politics. In other words, his links to the other world enabled him to navigate this one. While King was playing the opposition, Bennett attacked the economic crisis of the early 1930s with traditional Conservative methods: he raised tariffs on manufactured imports to encourage domestic production and to create jobs. Yet the demand for exports dwindled, world prices deflated, and jobs disappeared. As the government's revenue declined, Bennett was forced to reduce the expenditures, especially the costs of unemployment and farm relief funds. Canadians became desperate for food, shelter, and relief in both city and county; regional and class conflicts encouraged demagogues to laud the extremes of the far right and far left. King had built his reputation on caution, compromise, and half-measures. While his policy-making methods seemed out of place in a world battling between fascism and communism, he was nonetheless back in office by 1935, heading the largest majority in the history of Canadian parliament. He had kept the Liberals together while the Conservative Party disintegrated under the worst years of the Great Depression, by finding consensus among liberally-minded Canadians. His talents as a conciliator proved critical: he proposed instituting a government-controlled central bank that could modify the money supply as necessary. Thus he developed a fiscal policy that regulated business without resorting to the socialist solution of government ownership, satisfying both moderates and radicals. 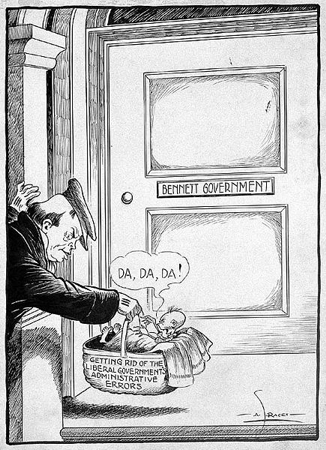 When Bennett promised to introduce legislation to bring in a sweeping social safety net in 1935, he had not counted on King's strategy of cooperation. After the Liberals encouraged the government to immediately implement its new relief legislation, the Conservatives were forced to admit that they had none prepared. As the Conservative Party splintered, a united Liberal Party swept in to take 173 seats in the October 1935 federal election. The relationship between the federal government and the provincial governments was fragile, as each faced declining revenues and increased welfare costs. The provinces, which could no longer finance even essential services without assistance from Ottawa, depended on the federal government for subsidies and loans. Unprepared for constitutional changes that might overextend federal finances, King focused instead on his government's fiscal stability, believing that costs would be reduced if the provinces administered their relief more efficiently. King steered a careful chart out of depression with relief acts such as the National Housing Act and the National Employment Commission. The Bank of Canada, meanwhile, was transferred from the private sector to the Crown. He also conceded to exert more government control over the economy by budgeting for a deficit in 1938 and 1939, to placate colleagues who theorized that the government could increase employment by spending when private investments were low. The economy could furthermore be stimulated by lowering trade barriers: in 1938, King encouraged British Prime Minister Neville Chamberlain to negotiate a trade agreement with the United States that would also provide tangible benefits for each region of Canada. By the end of the decade, however, the economic situation was becoming overshadowed by the threat of another general European war. 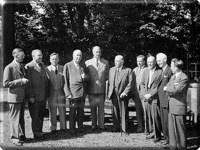 King had decided at the beginning of his term that membership in the League of Nations might have serious political consequences for Canada. While he affirmed his support for the League as an institution for the resolution of disputes, he rejected the idea of the League as a military alliance against aggressors. Fearing domestic division should Canada become militarily involved in European affairs, he told the League in 1936 that Canada did not support "automatic commitments to the use of force." 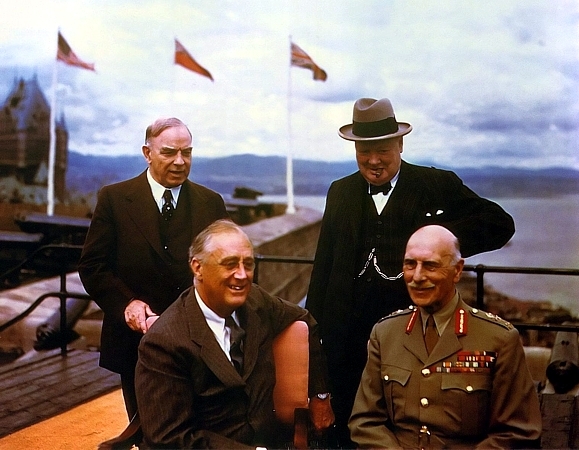 Although King preferred to resolve international dispute through negotiation and had tried to reduce defense spending, it had become apparent by 1937 that Canada had to take responsibility for its own defense. King overrode opposition within the Liberal Party to double the defense budget, spending most of the money on the air force and navy. By this time, he had to admit that Canada's membership in the British Commonwealth meant that it could not isolate itself in the event of another European crisis. 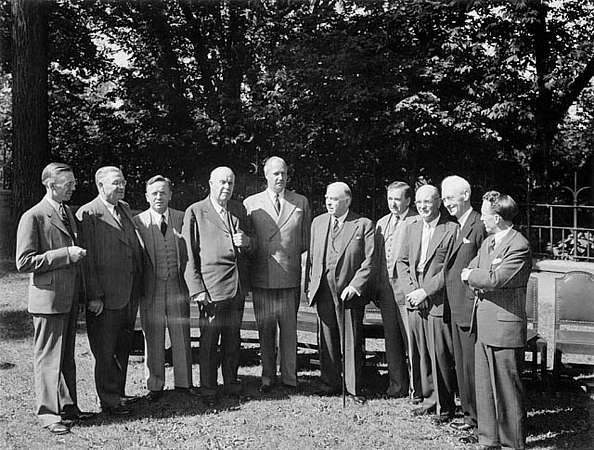 At the 1937 Imperial Conference, King encouraged Chamberlain to resist confrontation with Germany and instead resolve disputes through peaceful negotiations. After the conference, King traveled to Germany to meet with the Fuhrer, warning Hitler that Canada would support Britain if Britain was drawn into war. Optimistic that armed conflict could be avoided, King reported to Chamberlain that Hitler "seemed to be a reasonable man." The Munich Agreement of September 1938 changed his mind. King predicted war between Germany and Britain and believed that most Canadians would want to be involved. At Parliament in March 1939, he explained that a German attack on Britain would threaten "freedom in all parts of the British Commonwealth;" and should war break out, parliament alone would decide what course to take, basing its decision on Canada's best interests. When Britain had declared war in 1914, He further promised never to introduce conscription for overseas service. This approach, however, meant that Canada had no role in shaping British foreign policy. King was shocked, but supportive, when Chamberlain reversed Munich in March 1939 and promised to defend Poland. When Britain declared war on Germany and Austria in 1914, Canada was automatically committed as well. 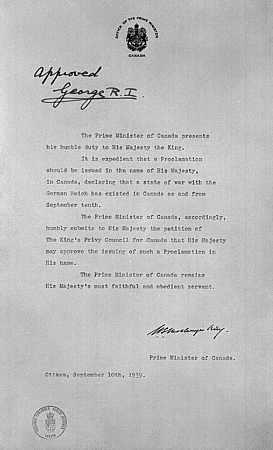 After Britain declared war on 3 September 1939, King proved Canada's autonomy by keeping his promise that Parliament would decide its country's course. The emergency session opened on 7 September. The decision to enter into war, so controversial just a year earlier, was a resounding yes. The pressures of depression and international relations had exhausted King, now in his mid-60s. Prior to the war, he had explored the possibility of retirement in his diary. Now that political leadership meant more than keeping the Liberal Party in power, however, he understood the importance of his duties. The Royal Canadian Navy went on convoy duty immediately. The 1st Canadian Division of the army went overseas in December. After France capitulated in June 1940, Britain's survival depended on support and industry from North America. Canada supplied Britain with urgently needed food, munitions, and resources delivered by naval convoys and airlifts, in addition to hosting the British Commonwealth Air Training program, the largest air force training program in history. In August 1942, nearly six thousand soldiers of the Second Canadian Division landed on the coast of occupied France, supported by British naval and Allied air force contingents. The Dieppe Raid was the only major combined assault on France prior to the invasion of Normandy in 1944, and served as a test of a full-scale invasion of Western Europe. The results were disastrous: with sixty percent of the forces killed, wounded, or captured, none of the major objectives were accomplished. The Essex Scottish Regiment was one of three units involved in the main attack on the beach. The unit faced heavy machine-gun fire immediately upon landing at the steep pebble beach. One hundred twenty-one men were dead by the end of the raid, with many more injured or taken prisoner. The Essex Scottish returned to France two years later to take part in Operation Atlantic, a Canadian offensive launched as part of the Battle of Normandy. Although the operation was successful at the outset, with the Canadian units making gains around the Orne River, they could not penetrate the strong German fortification on Verrieres Ridge. The two SS Panzer Divisions that counterattacked hit the Essex Scottish Regiment, a supporting battalion, especially hard, killing over three hundred men. With over 2,000 wounded and over 550 dead by the war's end, the Essex Scottish Regiment had been inflicted with the highest number of casualties of any unit in the Canadian army during the Second World War. 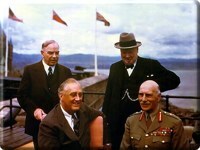 King was not a dramatic wartime leader; there were no Churchillian speeches or fireside chats to rally his countrymen. But the political sensitivity he had developed over decades of experience suited him to a Canada at war. His skills allowed him to maintain the delicate balancing act between Canadian autonomy and Britain's ally. He also acted as an intermediary between Roosevelt and Churchill until the United States joined the war in December 1941. His leadership and authority, however, were most seriously tested by the issue of conscription. From the beginning of the war, he had promised that only voluntary recruits would be sent overseas - but after the fall of France, Britain's survival became tenuous. Allied defeats in Europe and Asia in 1942 convinced many Canadians that their full commitment to the war effort required overseas conscription. King called a national referendum in January to ask voters to release the government from its promise that it would not institute a draft. The results of the April plebiscite revealed a country divided: eighty-three percent of English Canada voted in favour of conscription; however, less than thirty percent of Quebec voted similarly. 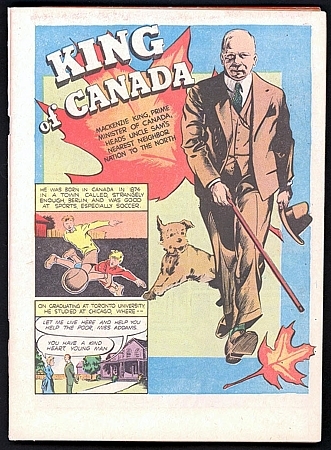 "I felt very strongly," King wrote on 27 April, "that to keep Canada united, we would have to do all in our power from reaching the point where conscription for overseas would arise." Canada made due without resorting to the draft until it sustained heavy casualties during the Normandy invasion in June 1944. When Defense Minister J. L. Ralston obdurately decided conscription was the only way to provide the necessary reinforcements, King replaced him with General A. G. L. McNaughton, who King hoped would attract sufficient volunteers. Only after McNaughton too came to the conclusion that personnel requirements could not be met by voluntary enlistment did King make the difficult decision to send conscripts overseas for home defense. By this time, however, it had become clear to French Canada that the Prime Minister had sympathized with its position, and had delayed conscription for overseas service as long as possible: I did not intend to have on my conscience the thought that I had not done everything possible to ensure the lives of the men overseas," he wrote on 22 November 1944. Thus King kept his party and his country together through a controversy that had threatened to tear it apart. As the European and Pacific wars closed in 1945, hundreds of thousands of workers were released from munitions factories, and almost one million members of the armed services returned to civilian life. Canadians looked to the government for security during the transition to a peacetime economy, and King responded by shifting to the left. 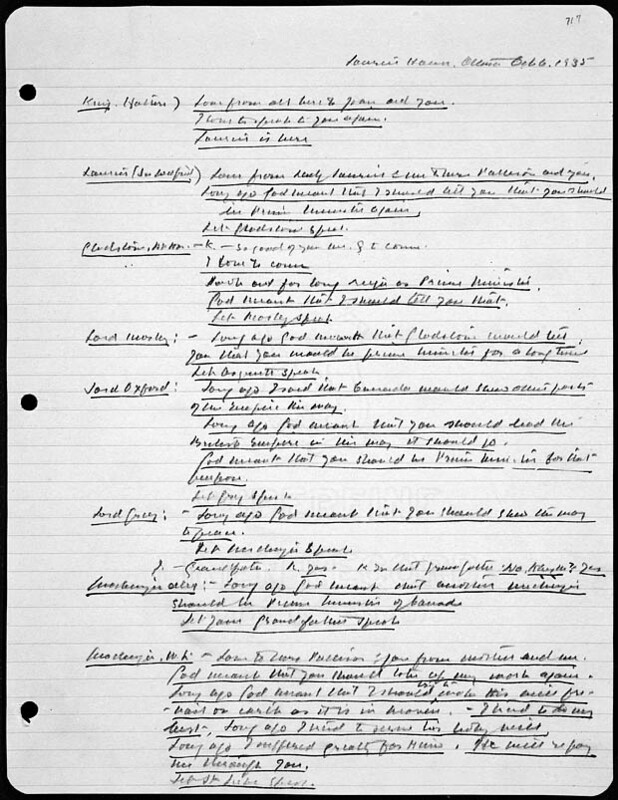 In 1945, the government's financial advisors advocated increased public expenditures to create jobs and family allowances to boost consumer demand. Although King was still uneasy with government deficits, a Liberal government, in his mind, was better than a socialist Co-operative Commonwealth Federation one. The broad social security program on which he campaigned won a narrow victory for the Liberal party. 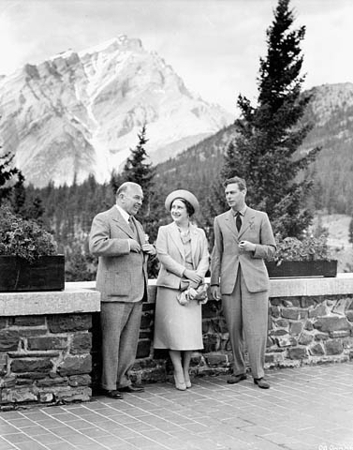 The following year, King witnessed the birth of Canadian national identity in 1946 with the passing of the Canadian Citizenship Act, an act of Parliament which legally defined a Canadian citizen, separate and distinct from a British subject living in Canada. 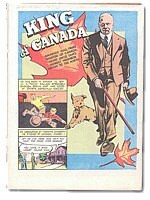 The King administration's wartime record had secured King's place in history as one of Canada's greatest prime ministers. But the post-war world had changed too much for King. Ill at ease with the demands made on Canada by the Cold War, he feared the country would be pulled into the imperial orbit of the United States. The need for fiscal planning, moreover, necessitated federal jurisdiction over income and corporate taxes, and King worried about a system in which provincial governments depended on federal subsidies. Four decades of politics had finally worn him out. In May 1948, he told Justice Minister Louis St-Laurent that he could not face another campaign. He resigned as party leader in August and retired as Prime Minister on 15 November. On 22 July 1950, a year and a half later, he passed away from pneumonia at Kingsmere, and was buried in the family plot at Mount Pleasant Cemetery in Toronto. 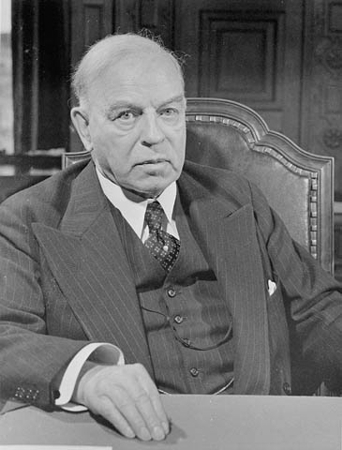 The Canada William Lyon Mackenzie King left in 1950 bore little resemblance to the one he inherited as Liberal leader in 1919. 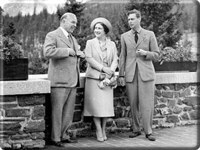 Through King's party leadership and his political steadiness throughout three decades of tumultuousness, Canada had become prosperous and united, domestically stable and autonomous in international affairs. King's liberalism, political sensitivity, and conciliatory skills enabled him to realize the full actualization of the nation for which Sir John A. MacDonald had laid the cornerstones.